Last Friday evening, I braved the colder weather of Olde City, Philadelphia to investigate new work by artists showing as part of the “First Friday” evening art gallery openings. Katherine Fraser’s paintings at Artists’ House Gallery were by far the most engaging items I found amongst the various media on the numerous gallery walls and floors I traversed that night. 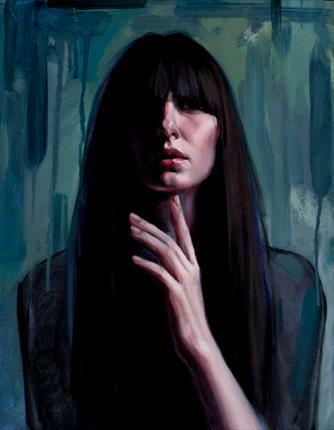 Intuition (oil painting, 18″ x 16″) portrays a frontally-focused female placed on a stark-ish background of teal, sage green, indigo blue and blackish hues. While the dramatic focus centers upon the one-quarter highlighted portion of the subject’s face, the elegant hand/arm appears almost as a rupture across the canvas swooping upward from the bottom-right. One cannot help but recall Norwegian Symbolist painter Edvard Munch, and the framing of his subjects, as they evoke a similar memory when looking at this piece of Fraser’s work. It is quite possible that Ms. Fraser was partially influenced by this genre of painting, as she was the recipient in 2000 of the prestigious William Emlen Cresson Travel Award from the Pennsylvania Academy of Fine Arts (PAFA) in Philadelphia; other area artists I’ve known who’ve won this award have used this opportunity to travel through Western Europe during the summer months to observe the artistic techniques used by the “Masters”. However, Fraser’s sense of painterly realism is much greater and more contemporary than the Masters that may have influenced her that are suggested here. 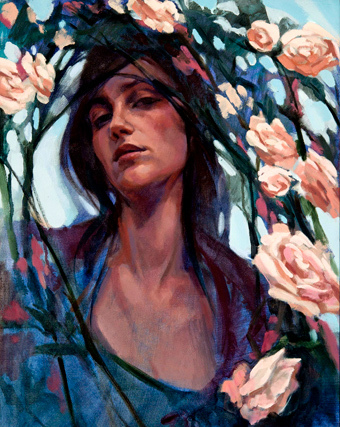 Horizon (oil painting, 32″ x 40″) uses that darker, “mysterious” palette of Indigo blues and sage accents previously seen in Intuition with that same partially obstructed shadow covering the subject’s eyes and upper face. One can’t help but wonder – are we not supposed to see her? As if her face is something only for the subject and artist Fraser to know more vividly? The elongating of the female’s anatomy here is further emphasized by the diagonal projection from the bottom of the canvas of the vehicle where she sits. 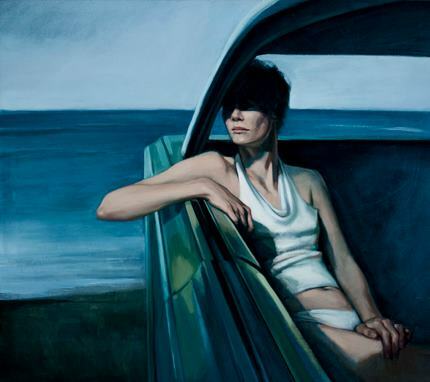 Others in the gallery were mystified as to whether that is a boat she sits upon in the opposite-direction of the sea, or a late-model Chevrolet that has been brought upon the beach. Although the piece’s title is named for the simply-but gorgeously-illustrated horizon – I find it very hard to imagine the viewer half as enchanted by the sky and water vista as the female subject herself. Katherine Fraser is one of seven artists exhibiting this month at Artists’ House, February 1st through the 26th, located at 57 N. 2nd Street in downtown Philadelphia, PA.
(1) Vision and Difference (London and New York: Routledge, 1988), p. 135. Thank you, Barbara, for commenting. I’m also drawn to female subjects in art, and it’s likely the frontal positioning of the female subject here that makes me most think of Munch’s painterly compositions.